Careful planning is required for an heirloom project and most times it will be necessary to test out how design combinations will look. May I encourage you to try anything that comes to mind, especially if it almost sounds too challenging. 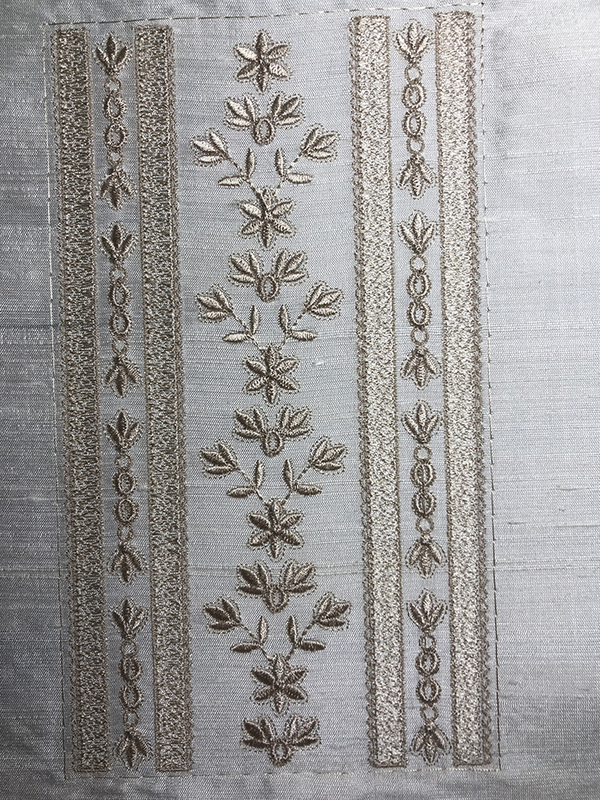 Very often what we think is not possible in machine embroidery, can in fact be done with some careful consideration along with use of the right designs, fabric, thread and stabilisers. 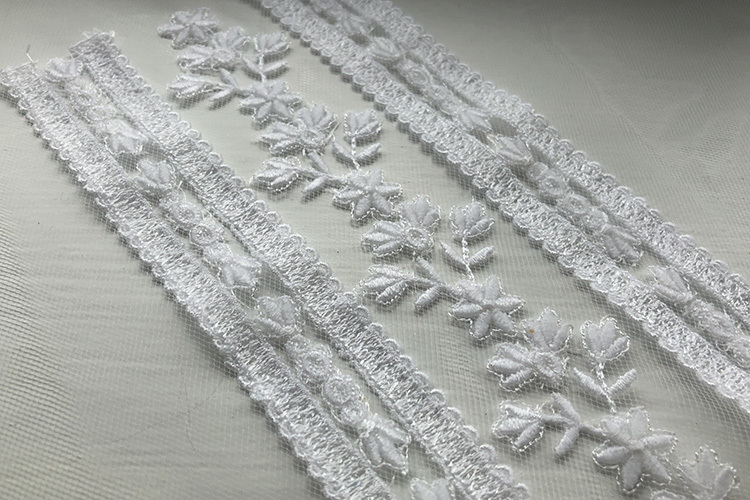 After discovering a while back that the designs in the Regency Whispers collection stitch out perfectly on English cotton net, I am now willing to try a few more experiments and encourage you to do the same. Of course if successful share your experience with us all! 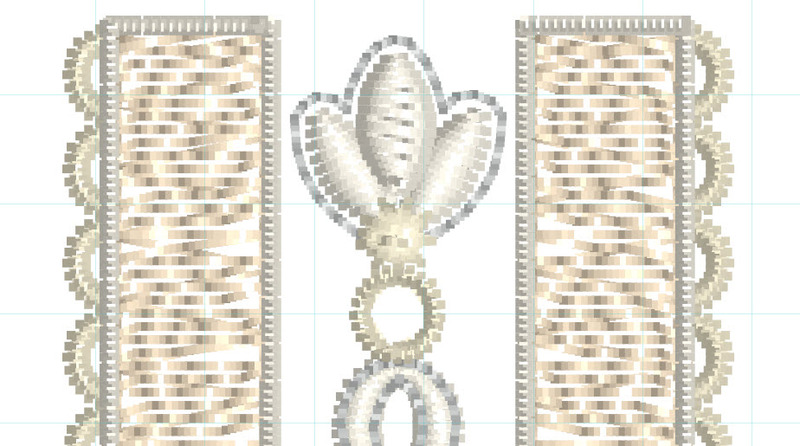 Prior to the release of Royal Heirloom 2, which has 12 designs for 5″ x 7″ hoops, I decided that I would do a combination of design #10 as I think it would make a great bodice. Let me share how it went. Firstly I needed to prepare the design in my software as shown in this video. I hooped some stitch and tear stabiliser and added my pale gold silk dupion with temporary adhesive. 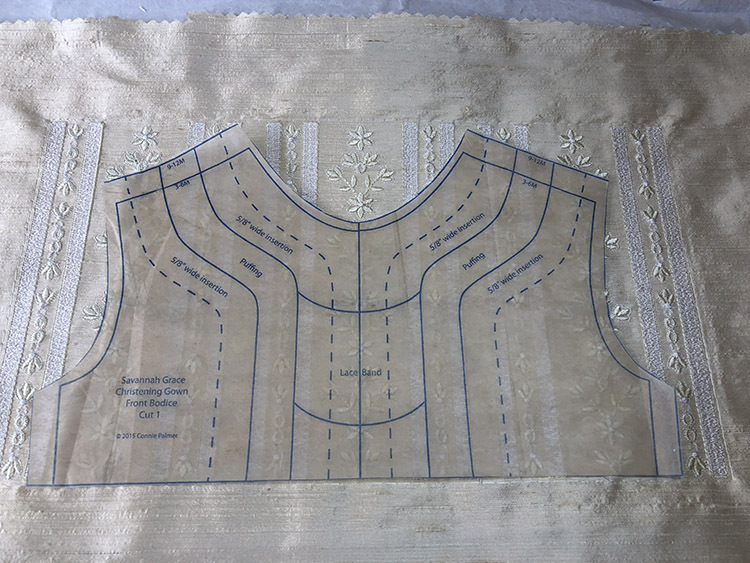 This is my preferred method even for silk and the wonderful thing about the Outline alignment stitches that hold it in place before it is embroidered so that I can check that the silk had been place accurately as the stitches will run along the pronounced weft of the silk. Naturally if they are slightly out of line, you should remove the hoop from your machine, unpick the stitches and start again. My favourite silk is wild silk dupion, featured on the background of my website and in this stitch out. It is made from silk from caterpillars other than the mulberry silkworms and so it is less uniform in appearance, having tiny joins and ridges. I needed to decide which way I wanted the weft threads to run. Remember that the warp threads are added to the loom first, and the weft threads are woven back and worth between them creating the selvedge. I chose to make the weft threads run horizontal in contrast to the lace. First to stitch out are the open fills that mimic delicate lace. I choose to do these in ivory for this project. Next come the tiny edging and little sprays and flowers which were stitched in cream. Here you can see the over all effect of the finished panel. It was when this was finished that I decided it had something missing, and so I added a tiny row of optional scallops each side of the outer lace panels. These have not been added to any other of the lace “inserts” in the collection, at this point, and please be aware that if you were opting for shadow work, you would either have to miss them out or change the order of the colours ways and add them after the fabric is applied to the stabiliser, but before the stitches that secure the shadow work. Here you can see that I have laid a pattern piece of a bodice of a christening gown over the embroidered panel to show that it fits. How much easier this is than embroidering the cut of pieces of a project. 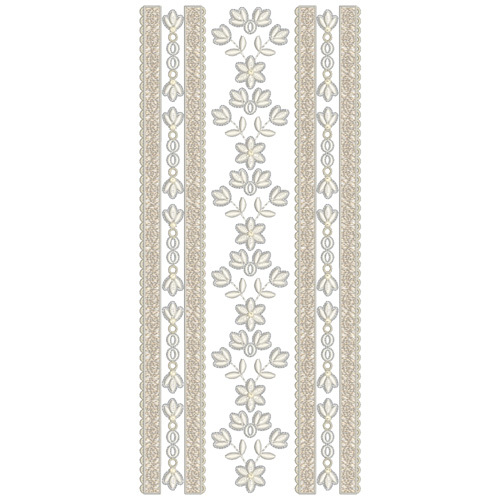 Aligning is almost guaranteed when you create the embroidered fabric first. If you were going to have a deeper bodice you would need this longer design which can be found in the 3rd set for 240mm x 150mm hoops. 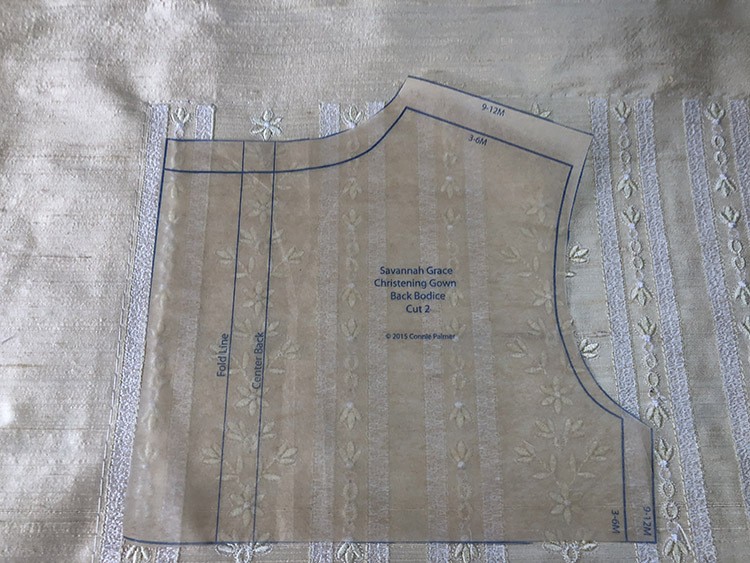 With careful positioning the two bodice backs can also be cut out of an identical second stitch out, if you place the centres at the sides, being aware that you do not need embroidery on the underneath where the fabric is folded or within the seams. This entry was posted in Discussing machine embroidery, New Designs, Videos and tagged combining embroidery designs, embroidery on silk, heirloom embroidery, Hooping only stabiliser, Making embroidered fabric, shadow work, wash away stabiliser. Bookmark the permalink. stunningly beautiful. Thank you for your tutorial! If there were only more hours in each day. Think what we could create. Hazel, that is such a good tutorial, & the stitch out is WONDERFUL! Thank you so much for commenting on my post. Your comment has been chosen as comment of the week! This is amazing. I have been drawing my pattern on my material with a water soluble grown and then hoping with spray adhesive, positioning my design and praying! Thank you!